Many visitors have contacted me over the years about allergic reactions to Laundry room household chemicals (such as laundry detergent and especially Downy Fabric Softener Sheets). I have also receive many questions about hazards related to washing machines and gas clothes dryers - regarding toxic black mold, fire potential, and carbon monoxide gas dangers. Because of diverse and frequent concerns and symptoms, it is obvious to me that the laundry room is often a major source of indoor air pollutants and accidents in the average home. What about your home? Below are some environmental health and safety tips and resources that will help you identify and correct potential laundry room hazards that could affect your family's health. Please do consider the below complex chemical compounds and other dangers associated with the areas where clothes are washed or dried, especially if you are concerned about Asthma, breast cancer, lung disease, organ damage, Autism, Alzheimer's Disease, Multiple Chemical Sensitivities, or general symptoms of indoor allergies. Be sure to check out the below link to my other website on which I have a popular extensive FREE list of cheap, non-toxic home-made household products recipes - including safe and easy to make home-made fabric softener and home-made liquid laundry detergent and washing powder. Many of the visitors to this site have found out the hard way that their burning watery eyes, skin rashes, sinus problems, frequent respiratory difficulty, sore throat, fatigue, and headaches was related to laundry detergent or fabric softener fumes. Many also love that "fresh" Downy scent, but those potent fragrances and other "proprietary trade secrets" may become a major cause of allergy symptoms. One recent visitor even had a severe reaction to fabric softener sheets placed in a room of their house as a home remedy to get rid of mice. A small pile of fabric softener sheets bacame a lot more than just a rodent repellent. Don't try this at home! Severe allergy symptoms lasted for over two weeks for this person, even after cleaning and ventilating the room thoroughly. Those with Multiple Chemical Sensitivities will cringe at the thought I'm sure. Most brands of traditional fabric softener seems to be toxic for many. Here is one example of an email contact and my response to a visitor concerned about the dangers of toxic fabric softener as a result of a neighbor's over zealous laundering and clothes drying. If you are one of the many allergy sufferers wondering about possible fabric softener hazards, or if you have ever wondered, "is downy fabric softener toxic" - take a look at the page linked to above for downy fabric softener ingredients and material safety data sheet. You may wish to consider the many new less toxic "green" laundry cleaners now hitting the market shelves. Many of these eco-friendly laundry detergents and softeners are made with safer ingredients. But it is hard for me to trust the corporate claims since many are "green washing" or hyping a not so safe product as being environmentally friendly and less toxic, when in fact that is not really true. If you want truely safe, non-toxic, and CHEAP laundry detergents and softener, why not easily make your own at home. On my other frugal living website (Frugalicity.com) I have an extensive and ever-growing list of easy to make home-made recipes for all kinds of household products. You may like the section having a collection of my Frugal Recipes for Home-made Laundry Detergent and Fabric Softener. Please click "like" at the top of this page and also that recipe page if you want to help me spread the word to others interested in a less-toxic life-style. One family I know of has their freezer next to their washing machine and dryer and loads of household chemicals, all within a small room. The fragrances in the fabric softener and liquid detergent have permeated through ziploc bags and other plastic containers of food in the freezer. Most of the food has a faint smell and even taste of fabric softener. Believe me, if in food, this "essences of laundry chemicals" is extremely unpleasant for the appetite. This fragrance infusion into the freezer and it's contents occurred despite the fact that the dryer fumes are vented outside. But it is difficult to convince them there is a serious chemical contamination problem here for their food because they can neither smell it, taste it, nor can they comprehend how it is possible given that fumes are vented to the outside. Cooking may drive off some of these chemicals, but when you open the ziplock bags a person with healthy smell sense can surely discern the sweet chemical odors. I have even smelled it in glass storage containers. Despite venting to the outside, volatile organic compounds from washing machines and dryers can still fill your indoor air because heat and steam help these already volatile chemicals to escape from around the machine doors, especially if the lint trap becomes dirty or the ventilation pipes become clogged. And these fragrance molecules are designed to permeate materials and persist for a long time. They CAN go through plastics because they are molecularly similar hydrocarbon-based chemicals. 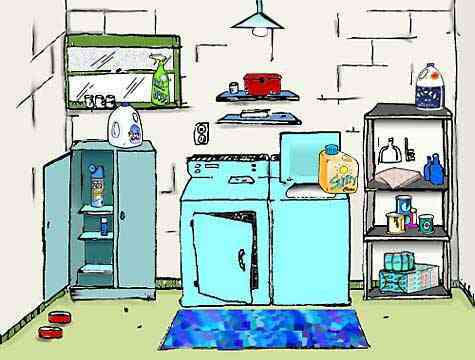 To learn more about common laundry room household chemicals check the chemical product section below. No one in that family can smell the laundry fragrance on the food, but it is quite obvious to me and another person who verified to them that it was not just my imagination. However, someone who has a history of cigarette smoking would probably have damage to their olfactory system and thus have a harder time smelling certain concentrations or types of odors. Likewise, job types can also cause damage to a person's ability to smell certain things - for example, someone who was a house painter for years or someone who inhaled petrochemicals and solvents in an industrial setting for years. This was true for these family members. Their sense of smell and taste was probably somewhat damaged. The above smell and taste challenged family also stores a significant quantity of volatile chemical filled containers of paint thinner, lacquers, oil-based paints, pesticides, solvent-based cleaners, adhesives, stains, and automotive chemicals in this confined laundry room area. They also can't smell the putride solvent smell oozing perpetually from this stockpile of hazardous household chemical products. It is VERY obvious! And to make the situation worse, besides the freezer, they also store potatoes, bulk food items, and non-airtight containers of pet foods for dogs, cats, and birds next to these chemicals. Again, when I open the pet food container outside of this area I can definitely tell that the pet food smells of these volatile organic compounds. Cereal-based dog and cat food and other food items may readily absorb solvent odors because they are porous and because they contain oils that grab on to the solvent vapor molecules. These food items are marinading in and picking up chemical contaminants from the air which still permeates through storage containers. I informed them also that it was a bad idea to store the cereal-based pet food near these chemicals because the fumes will continue to absorbed into the pet's food and thus may poison their pets slowly when the animals ingest the toxins daily. Even small amounts can be damaging over time. Several generations of their pets over the years have had a history of early onset cataracts, dimensia, respiratory problems, and heart disease. And the human family members suffer from various symptoms consistent with indoor air pollution from VOCs. This could be side-effect of these airborne chemical fumes from the laundry room area - both inhaled or ingested once adsorbed into food nearby. But unfortunately, since they can't smell a problem, and because like most people they are not aware of the long-term consequences of chemical exposures, they don't give it a second thought. I always believe in erring on the side of caution, even if a hazard is not blatantly obvious. Controling man-made chemical exposures, no matter the route, is always a good idea in my opinion. No one needs to convince me. But I still wish I could help them to help themselves. Some common laundry room household chemicals if mixed may produce deadly gases like Chlorine gas and Chloramine. Never pour chemicals down drains for this reason and because it is often damaging to the environment. NEVER mix Chlorine Bleach with acidic products, such as: Drain Cleaners, Ammonia, or vinegar. Acids will react with bleach to liberate these deadly gases. In the least they will cause serious eye, skin, and respiratory irritation. In the worst case scenarios, Chloramine and Chlorine have caused death of children and adults. Laundry Rooms like Kitchens are areas where fire hazards are more likely because heat energy is frequently being applied to potentially combustible materials and the appliances pull a lot of electrical current too. Most fires in laundry areas are associated with dryers and the build up of lint causing the dryer vent to become blocked, followed by possible over-heating of the dryer and ignition of combustible materials. See the following entry for more dryer fire safety tips. Be sure all the rooms and hallways of your home have Smoke Detectors in good working order. My smoke detectors are hard wired into my home's electrical supply, but they also have disposable battery backups in case the power were to go out. By changing these batteries in smoke and carbon monoxide detectors yearly when daylight savings time ends, it will be easier to remember to do this important task. Smoke detectors have saved many lives by giving early warnings by waking sleeping occupants during the very first smoldering stage of fires. This early warning is especially important near areas where combustion occurs - such as next to garages, basement furnace areas, kitchens, or where there are gas appliances and fireplaces. Modern homes are so filled with plastics and synthetic materials that even a small fire can within minutes produce enough poisonous gases to overwhelm occupants. Smoke inhalation and toxic gases such as carbon monoxide can make you lose consciousness within minutes and this is the main hazard of fire situations. Smoke detectors and carbon monoxide detectors are some of the most important home safety devices you can install. The small investment can save lives, so make sure your home has them and that they work (use the test button to see if the alarm sounds). But do be aware that by virture of how some Smoke Detectors work, they may contain a small amount of a radioactive element known as Americium-241. See the below section on Smoke Detector Safety to learn more about this potential source of radiation. A properly classed Underwriters Laboratory approved fire-extinguisher is also a must-have in the above fire-prone areas of your home. In my house I have several wall-mounted dry chemical fire extinguishers of the B-C class. BC fire extinguishers will work to smother fires from flammable liquids (such as gasoline), grease fires, and also electrical fires. Just be sure to check the extinguisher gauge periodically to verify that it is still fully charged and ready for use, and make sure all occupants know where to find and how to use the extinguisher. Mount or place extinguishers where they can be easily seen and accessed. If you discharge your extinguisher, make sure to immediately replace it with a new fully charged one, and discard the old one following the instructions that came with the extinguisher. If your laundry room has gas-powered appliances, such as a gas dryer or gas hot water heater, deadly Carbon Monoxide is a particular home hazard to be aware of because it is colorless, odorless, and can kill or do permanent serious health damage within minutes. Many deaths have resulted when occupants were overcome by Carbon Monoxide gas inhalation. CO molecules bind to Hemoglobin in Red Blood Cells more readily than does Oxygen, so you can quickly expire from lack of oxygen (asphyxiation). Wherever in your home combustion of anything occurs, there may be an elevated CO gas risk. Deadly levels of CO gas can quickly accumulate in our air-tight homes and dangerous levels can persist for a long time in confined spaces such as poorly ventilated rooms, even after the combustion source is removed or turned off. Make sure any type of combustion equipment is properly ventilated to the outside and that exhaust vents never become blocked by anything. I know of one instance when a sleeping female occupant of an apartment died from Carbon Monoxide poisoning because a pet boa constrictor had earlier escaped and then later crawled into a furnace exhaust duct from the outside opening. The snake's body was large enough to block exhaust gas flow, which created back pressure and allowed Carbon Monoxide gas to build up inside the apartment rather than venting to the outside via the exhaust duct. This is an example of how a CO detector could have saved her life. Even if equipment is verified to be operating correctly, that does not mean that a malfunction or scenario can't later happen to cause a CO hazard. CO detectors are very wise fail-safes that can prevent such freak accidents. Also consider the proven possibility that when negative pressure situaions are created anywhere in your home (such as from a running attic fan) it can transfer to all levels and interfers with proper exhaust gas ventilation to the outside. Gases flow down pressure gradients, so if a powerful exhaust fan creates more of a vacuum than is present in the exhaust duct of a natural gas powered furnace or hot water heater, Carbon Monoxide may take the path of least resistance into the surrounding indoor spaces. Areas of particular CO poisoning risk are garage areas, workshops, kitchens, furnace areas, basements, laundry rooms, near fire-places and wood burning stoves, near kerosene heaters, or wherever cigarettes and other things are being smoked. Follow installation instructions closely because proper placement of the detector is important for accurate and timely hazard detection. Often the alarm sounding on a Carbon Monoxide detector is the only way you would get an early warning that a CO hazard was developing. By the time symptoms of CO poisoning such as dizziness, confusion, drowsiness, or shortness of breathe begin to occur, death may only be minutes away. CO alarms, like smoke detectors and extinguishers, are must-have life-saving devices you definitely should have throughout your home and in good working order always. For more information see the below section on Carbon Monoxide Gas safety. There are over 15,000 dryer fires in the U.S. every year, causing over $80 million in property damage, according to the U.S. Consumer Product Safety Commission. Most dryer fires are caused when the dryer vent duct or internal parts become clogged with dryer lint. A contributing factor can also be a clogged dryer lint trap. It is a good idea to periodically have your dryer professionally inspected and cleaned, especially if the drying time seems to be increasing, which indicates possible poor air flow at some point in the system. Also be sure to read the operators manual for safety recommendations, such as what materials and objects should not be placed in your dryer. To reduce the risk of a dryer lint fire, use metal ducts rather than plastic or foil duct pipes. The less ridges, bends, and curves in the ventilation duct - the better, otherwise lint may be more likely to build up at these low places or bends within the duct. Metal ducts don't sag as much, thus preventing bends or low spots where lint can accumulate. Metal dryer vents are also more fire resistant, should lint ignite within the duct. If shopping for a new dryer, look for one with a moisture sensor - which tends to be safer than the traditional temperature sensors, because it will prevent a dryer from further heating already dry clothing, thus saving energy and reducing fire hazard. You should also regularly clean inside, under, and around your dryer to assure lint and other combustibles are not building up. Check the outside duct outlet periodically to make sure lint is not building up and blocking the exit as well. Always remove lint from the screen after each load. Also clean your dryer lint filter screen with hot soapy water and a small brush such as an old toothbrush to remove the waxy build up from fabric softener and detergent that can block the small holes in the lint trap. It can be very hard to see this chemical residue is blocking the small hoes. If air can't pass freely through the lint trap, it reduces the dryer's efficiency (costing you more on energy), and it makes over-heating more likely. There have also been instances when clothing saturated with flammable materials, such as gasoline, alcohol, cooking oils, Spot Remover, or volatile Dry Cleaning Fluid, was run through a single wash cycle followed by drying which resulted in fires when remnant flammable solvent ignited in the dryer. Multiple washes and outside clothes drying using a clothes line would be a better idea in that case. Contaminated clothing should never be mixed with other clothing because most household solvents can be inhalation hazards and may have other components that can irritate the skin, eyes, or respiratory system. Also keep in mind that oily or solvent soaked rags and clothing are also a serious fire hazard because static sparks can cause spontaneous ignition independent of the laundry process. Never leave piles of oily or chemical soaked clothing or rags laying around. There are special NFPA approved metal fire-proof containers with spring loaded lids for workplaces that frequently produce combustible wastes - like oily or solvent soaked rags in garages. But the additional hazard of off-gasing of volatile chemicals into the air you breathe should also be a consideration in those instances. Make sure that you have properly wired and functioning ground fault circuit interrupter (GFCI) outlets installed in the laundry room, bathrooms, kitchen, porches, pool areas, and other areas where outlets will be next to sources of water. Usually any outlet within a certain distance of a home water source is required to be a GFCI outlet according to most building codes. The circuits are designed to trip upon being shorted out (a "ground fault") which often occurs due to damaded wiring, or exposure to water. Once tripped, power is automatically shut off to that circuit to prevent electrocution or fire-hazard. GFCI outlets are much more sensitive to low voltage power spikes than are the regular circuit breakers in the fuse box. It is estimated GFCI outlets may help to prevent hundreds of electrocusions every year. But to assure proper operation, the test / reset button should be checked monthly to assure they still work properly. Lightening strikes, general power surges, or improper installation may cause GFCI outlet malfunction. The only way to know is to test them. Following is a simple fast way to check the operational status of your GFCI outlets. Push the "reset" button on the outlet, then plug a floor lamp into the outlet and turn the lamp on. The light should come on. If it does not light at this point, there may be a malfunction though it could be possible the main circuit breaker in the fuse box tripped as well, so you may want to check that. If the light comes on, then push the "test" button. If the light stays lit when the "test" button is pushed, the GFCI outlet may be malfunctioning or improperly wired. Call a certified electrician for final diagnosis and repair. Many people suffer from dust mite allergies and don't even know it. A possible dust mite allergy problem is best taken care of at two main battle fronts: in your beddrooms and in your laundry room. Dust mites are microscopic skin cell eating scavengers that live in just about all homes, particularly where we sleep. Dust mites deficate, shed cells, die and even decompose in our bedding - living out their entire allergy causing life-cycle under our noses. This detritus can produce a significant burden of dust mite protein which trigger serious cases of dust mite allergies and asthma. If you often have trouble sleeping due to respiratory irritation after going to bed, or if you wake up with eye irritation, sinus problems, skin rashes, headaches, or dry itchy nose or throat - it may be that you are having an immune response due to skin contact with or inhalation of the dust mite proteins. Dustmites love dark, warm, and humid environments where they can gourge on our shed skin cells. So you can control dustmites by maintaining humidity in your home below 45%, keeping air temperatures cool, and by frequently using a HEPA vacuum cleaner and the other below methods to remove their preferred food (our shed skin cells) and to remove them and their wastes. Dehumidifiers are good dustmite fighting appliances because they condense moisture out of your indoor air and help create a dustmite unfriendly environment. Dehumidifiers will also help to control black mold and mildew growth in your home. A good air purification system involving efficient HEPA room air cleaners and whole house HVAC air filtration with highly-rated MERV filters can help to filter out airborne dust mite particles, among other asthma and allergy triggers. Special dustmite killing laundry detergents and anti-allergen liquids and sprays, plus very hot water, will also kill dust mites and denature (or deactivate) the allergenic proteins during the wash cycles. Ideally the wash water should be greater than 130 degrees F. This will help anti-mite additives to work more efficiently to kill, denature, and clean bedding and clothing. And hot water will itself help to stress the dustmites to the point of death. You can also buy special dust mite proof bedding and anti dust mite covers for matresses, pillows, and comforters. Outside clothes drying using clothes lines will help to kill dustmites, bacteria, and mold spores too. The sun has a powerful bleaching effect and dust mites absolutely HATE intense light. They are no match for the high energy ultra-violet wavelengths that sunlight will bath them with. This is why ultra-violet sterilizers and vacuums with uv lamps for indoor use on bedding and floors is becoming very popular for dustmite control. Drying clothes outside, besides saving energy, will also expose dust mites and other remaining allergens to ozone gas molecules present in the air. Ozone, like sunlight, can also have a powerful bleaching effect - killing dust mites, bacteria, and mold spores. Laundry rooms - like kitchens, basements, and bathrooms - tend to be more prone to mold problems because they contain water pipes, drain lines, and steam producing activities and appliances. Toxic Black Mold and mold spores are some of the most wide-spread and potent contributors to indoor air problems and allergy symptoms. To control mold you have to control moisture. Inspect regularly for signs of any water leaks or mold growth around appliances, water lines, drains, and ducts. Look for moist spots or discoloration on flooring, ceilings, or walls. Clean your dryer's lint screen and exhaust ducts often. A full load of wet clothing contains more than half a gallon of water, which the dryer will convert to water vapor in the air. You want the dryer steam to vent unimpeded to the outside, otherwise all that water vapor may condense somewhere inside (wherever there are cooler surfaces) or it may absorb into materials like wood or ceiling tiles raising their moisture content and the likelihood of mold growth. Fix any water leaks you find, no matter how small. Even a small drip from a water line can cause significant damage and mold problems over time, and you never know when a drip from a water pipe may suddently become a geyser. When your washing machine will not be used for an extended period of time, it is a good idea to shut off the water valves so the water hoses are not pressurized. As an acquantance of mine found out, if you are away and a water supply line ruptures, the water damage and mold problems could easily end up costing you thousands of dollars. I now close valves and shut off breakers any time my washer and dryer are not in use. It saves energy because of less "ghost charges" through the circuit, and I never have to worry about the flex tube water lines bursting while we're not home. I get contacted a lot by homeowners concerned about possible causes of their indoor allergy symptoms or possible Sick Building Syndrome. But no matter how much detail is given, it is usually nearly impossible to diagnose with certainty the actual causes of the symptoms without doing accurate air testing. Often it is very difficult to surmise one obvious cause or magic bullet to correct the issue. Solving indoor air problems in many homes can be a real mystery because most homes have many different sources of indoor air pollution, and levels of these air toxins can fluctuate over time - even from hour to hour depending on indoor activities of occupants (such as doing laundry). And there are many other variables too. So there can be a mosaic of symptoms from this possible mosaic of inhalation hazards - such as burning eyes, nose, and throat due to Formaldehyde from decor items + skin rashes and sinus irritation from fragrance chemicals in fabric softener + respiratory illness from toxic black mold spores from the HVAC air ducts and basement. One dank basement laundry room I know of produced just such a scenario of causes and symptoms. In most cases, the best way to know what in your air may be making you sick, and what the sources of the contaminants may be - is to save money and your health by running this fast and simple mold and chemical air test. That advanced little air sampler, that even a child could set up, will tell you if your home may have a hidden mold problem or which of over 400 chemicals may be elevated in your air. The results will also clearly help you identify what the likely sources may be so you can remove them. By quantifying possible mold and hundreds of volatile airborne chemical contaminants, you will have covered the majority of possible indoor allergy causes. Having the test results in hand showing what the majority of your air profile looks like and what the problem sources likely are is the best way to not only to document an indoor air pollution issue (landlords can be very stubborn), but also to know what corrective actions need to be taken. There is no need to pay an arm and a leg to the pros for air testing. Liquid household chlorine bleaches contain approximately 5% sodium hypochlorite solution. When properly used, chlorine bleach can be a simple and effective disinfectant. Chlorine bleach liquid and vapors are irritating to the skin, eyes, nose, and throat. Dermatitis may result from direct skin contact. Ingestion can cause esophageal injury, stomach irritation, and prolonged nausea and vomiting. Bleach, when mixed with acidic substances such as Ammonia, toilet bowl cleaners, drain cleaner, or vinegar, forms toxic gases which can cause coughing, loss of voice, a feeling of burning and suffocation, and even death. Do not mix bleach with other household chemicals! CHLORINE GAS - Fumes highly irritating to eyes and respiratory tract; Chlorine may be release when Bleach is mixed with acidic liquids such as Drain Cleaner or Vinegar. At higher exposures, Chlorine gas inhalation can certainly be deadly or cause permanent damage to tissues. CHLORAMINE - if Bleack is mixed with Ammonia or other household products deadly chloramine gas can result. In the least Chloramine gas is extremely irritating to mucous membranes and the respiratory system. With higher exposures it can kill you. On my other website where I share my frugal living advice (Frugalicity.com) I have compiled a EXTENSIVE list of hundreds of FREE non-toxic, frugal homemade recipes for common household products - including a list of frugal recipes for making Homemade Laundry Detergent and Softener. If you like that list, which is ever-growing, please click the "like" button at the top of that page. It will help many other people to save a little money while helping the environment and reducing the amount of toxic chemicals families purchase and become exposed to. Carbon tetrachloride, now banned from household products, was the favorite solvent cleaner used in these products. A leading substitute, perchloroethylene orPERC, is a volatile, nonflammable solvent, that is fatal in large doses. There is concern over the chronic inhalation of perchloroethylene. The primary effect from acute and chronic inhalation of vapors is depression of the central nervous system. Other toxic chemicals often found in spot removing products include trichloroethane, ethylene dichloride, naphtha, Benzene, and Toluene. For specific health effects of these ingredients please refer to the individual headings. All of these solvents present an inhalation and ingestion hazard. Some also present a hazard through skin absorption. There are many types of dyes and which one you use depends primarily on the type of fabric that is to be dyed. Some of these dye types are known to be toxic or corrosive, some cause allergies (sensitizing), and some have long-term (chronic) health effects such as cancer. The chronic effects of most synthetic and natural dyes have not been fully researched. Many of the chemicals used in dyeing fabrics are hazardous to your health through skin contact and inhalation. Radon (Rn) is a colorless, odorless, radioactive gas. Radon is produced when trace amounts of uranium and radium in the soil or rocks decay. The radon gas will then also decay into radioactive solid particles, called radon daughters or radon progenitors. Some of the short-lived radon daughters attach themselves to small particles in the air, which can be inhaled deep into the lungs. The radon daughters may then damage dividing lung cells, possibly resulting in lung cancer. Radon gas is thought to be responsible for 5,000 to 20,000 lung cancer deaths per year in the United States. The major sources of radon are: soil that contains radon-releasing material; water and natural gas that has passed through underground areas containing radon; solar-heating systems that use radon-emitting rocks to store heat; granite rock; and uranium or phosphate mine tailings. Recently there has been growing concern over Radon being released from some types of Granite counter tops which may contain some Uranium compounds, depending on where it was mined from. Out-of-doors, radon poses little threat to our health because it is in such a low concentration. Indoors, however, radon can become more concentrated because of the lack of ventilation in homes combined with exhaust fans that draw air. Radon gas can seep into a house through dirt floors, cracks in concrete floors and walls, floor drains, sump pumps, and joints. Radon gas can also accumulate in private wells and be released into the home when water is used. This is normally not a problem for large community water supplies. The level of radon that can build up indoors depends upon the amount of radon in the source material and the rate at which it is removed from the home by ventilation. Homes tested throughout the U.S. show a wide range of radon concentrations. Radon is measured in picocuries per liter (pCi/l). One pCi/l means that for each liter of air or water, two radon atoms decay to other atoms per minute. Radon daughters are measured in working levels (WL), which is a gauge of exposure. One WL is approximately equal to 200 pCi/l of radon. The Environmental Protection Agency (EPA) recommends that household levels of radon and radon daughters stay at or below 0.02 WL (= 4 pCi/l). There are two commercially-available radon detectors; the charcoal canister and the alpha-track detector. Both of these are exposed to the air in your home for a specific time period and sent to a laboratory for analysis. The EPA has put out two informative booklets: "A Citizen's Guide to Radon: What it is and What to do about it", and "Radon Reduction Methods: A Homeowner's Guide." As you can probably tell by all the above information, most of the household products found in the laundry room are full of hazardous substances that can contribute to serious indoor air pollution and environmental damage. If you have any of these products inside your house I strongly recommend you read the label closely for storage, disposal, and usage instructions. Try to minimize your exposure to the gases and particles from these laundry chemicals and try to minimize contamination of your home as a result of their use or storage. Set a goal to progressively reduce your household chemical purchases. Try to keep your chemical inventory to the absolute minimum, with a few less toxic basic products that can multi-task for various purposes. Also try my above linked to extensive collection of frugal home-made recipes to make your own safer cheaper alternatives. Additionally, ventilation and the best home air purifier can reduce volatile organic compounds and dangerous chemical particles which results from areas in the home where many of these laundry room household chemicals are ultimately used. However, the best solution for controlling indoor air pollution and environmental effects caused by purchasing, using, and disposing of the above laundry room household chemicals and household hazardous wastes is source control and elimination wherever possible.